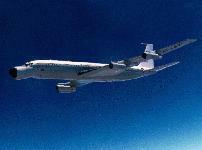 The two EC-18B Advanced Range Instrumentation Aircraft were retired 24 August 2001. 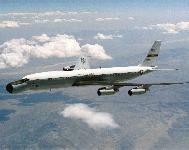 Both EC-18Bs assigned to Edwards AFB were transferred to the Air Force's Joint STARS program by September 2001. The costs associated with maintaining the aircraft and its capability became a major factor in ending the ARIA program. The 452nd Flight Test Squadron at Edwards Air Force Base operated a variety of unique, highly modified C-135 and C-18 aircraft to plan and execute DoD, NASA, and operational flight test programs. Missions supported include worldwide telemetry gathering, international treaty verification, spacecraft launches, ballistic missile defense, electronic combat and vulnerability analysis, aircraft icing tests, and aerial refueling certification. The 452 FLTS accomplished its primary mission using the Advanced Range Instrumentation Aircraft (ARIA) and the Cruise Missile Mission Control Aircraft (CMMCA). 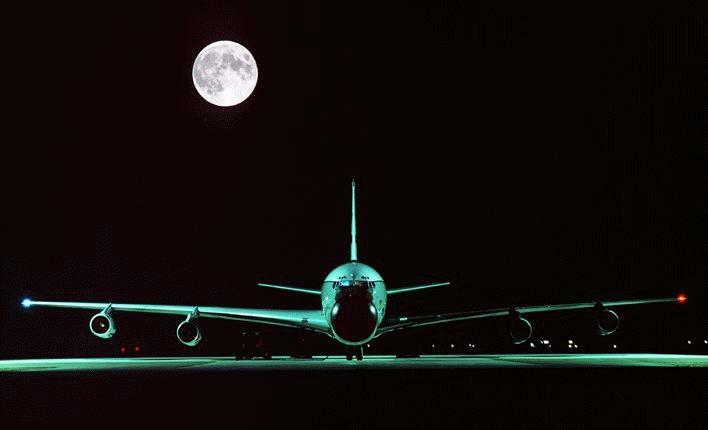 The ARIA, which originally stood for Apollo Range Instrumentation Aircraft, traveled the globe and serve as airborne tracking and telemetry data-recording and relay stations. They flew over land where ground tracking stations are limited by geographical constraints and over broad ocean areas where tracking stations do not exist. The unit supported a variety of national and international customers, both military and commercial, including NASA and Department of Defense missions supporting unmanned space launches, cruise missile tests, Army, Navy and Air Force ballistic missile tests and space shuttle launches. 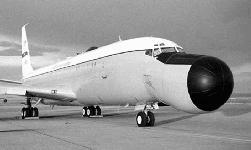 The Advanced Range Instrumentation Aircraft (ARIA - pronounced Ah-RYE-ah) were EC-135E and EC-18B aircraft used as flexible airborne telemetry data recording and relay stations. These aircraft were designed and developed to supplement land and marine telemetry stations in support of DOD and NASA space and missile programs. The ARIA have the capability to acquire, track, record, and retransmit telemetry signals, primarily in the S-band (2200-2400 MHz) frequency range. ARIA possesses a sagging and misshapen nose as its most distinguishing feature, earning it the nicknames "Droop Snoot" and "Snoopy Nose." The bird's bulbous beak is actually a 10-foot radome housing a seven-foot steerable dish antenna. The 450th Test Squadron provides maintenance personnel and enlisted "prime mission electronic equipment" operators. A typical instrumentation crew has six to nine enlisted PMEE technicians, a mission commander (an officer) and a flight crew of two pilots, navigator and flight engineer. While on deployments, ARIA teams must be self-sustaining because auxiliary aircraft are rarely sent. Consequently, six maintenance people - usually three crew chiefs and three specialists - supplement crews. Before every mission, the 452nd and 450th test squadrons devote three days to calibrating the aircraft's electronic instruments. They perform a final shakedown of the telemetry equipment while en route to the vehicle lift-off coverage area. In the early 1960's, the National Aeronautics and Space Administration (NASA) realized that the lunar missions of the Apollo program would require a worldwide network of tracking and telemetry stations, many positioned in remote regions of the world. The Department of Defense (DoD) was also faced with similar considerations for its unmanned orbital and ballistic missile reentry test programs. Since land stations are obviously limited by geographical constraints, and instrumentation ships cannot be moved quickly enough to cover different positions during the same mission, it soon became evident that large gaps in coverage would occur. To fill these gaps, a new concept in tracking stations was developed - a high-speed aircraft containing the necessary instrumentation to assure spacecraft acquisition, tracking, and telemetry data recording. The same aircraft could provide coverage of translunar injection and recovery for NASA's manned space flight operations, as well as events of interest in the DoD orbital or ballistic missile reentry tests. 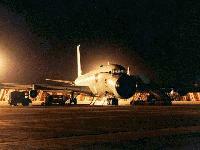 To implement the concept, NASA and DoD jointly funded the modification of eight C-135 jet transport/cargo aircraft. The Apollo/Range Instrumentation Aircraft (A/RIA), designated EC-135N, became operational in January 1968, having been modified at the basic cost of $4.5 million per aircraft. The Air Force Eastern Test Range (AFETR) was selected to operate and maintain the system in support of the test and evaluation (T&E) community. McDonnell-Douglas Corporation and Bendix Corporation were the contractors for the design, aircraft modification, and testing of the electronic equipment. In December 1975, after 7 years of operation by the Eastern Test Range, the ARIA (redesignated Advanced Range Instrumentation Aircraft following completion of the Apollo program) were transferred to the 4950th Test Wing, Wright-Patterson AFB, Ohio, as part of an Air Force consolidation of large T&E aircraft. The 4950th Test Wing provided test support, personnel, and resources for the operational use of, and modifications and improvement to the ARIA fleet. 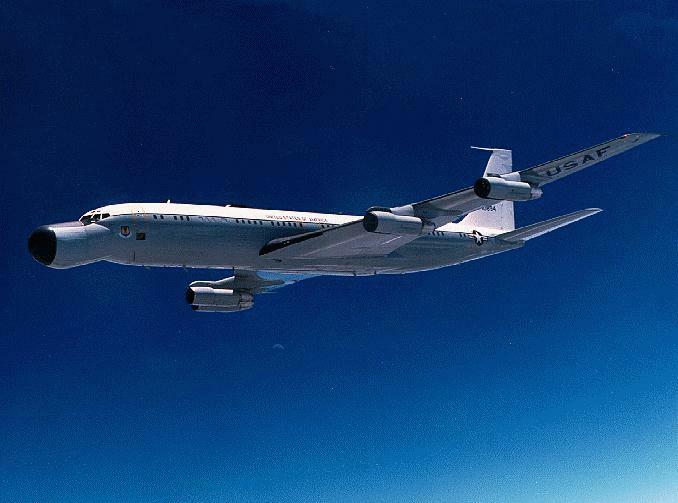 After arriving at Wright-Patterson AFB, the ARIA fleet underwent numerous conversions, including re-engining of EC-135N ARIA to EC-135E and the acquisition and conversion of used Boeing 707 commercial airliners to ARIA. 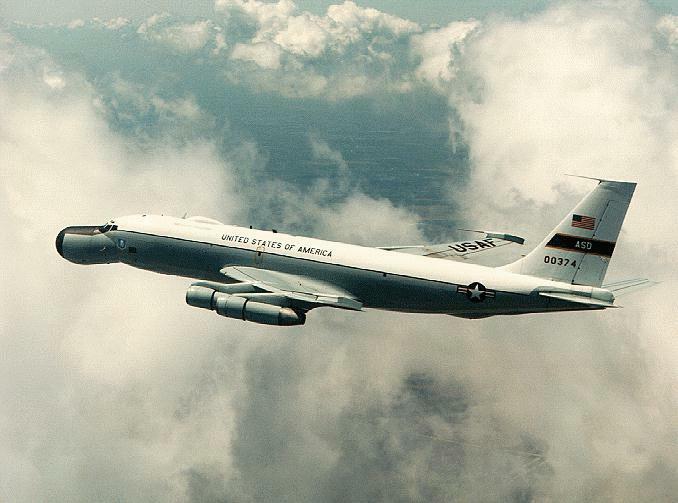 In 1982, the Air Force bought eight used Boeing 707-320C's from American Airlines, modifying the jets to the ARIA configuration and dubbing them EC-18B's. The EC-18B, which is larger than the EC-135N, carries a bigger payload and operates on shorter runways, flew its first mission in January 1986 out of Kenya. In 1994, the ARIA fleet was relocated to Edwards AFB, California, as part of the 452d Flight Test Squadron, in the 412th Test Wing. As of 1997 the ARIA fleet consisted of three EC-135E and three EC-18B aircraft. Only two of the original eight EC-135E Advanced Range Instrumentation Aircraft remained on active duty. The ARIA fleet consisted of three EC-18B's (which were populated with cannibalized E-model Prime Mission Electronic Equipment) and two of the original EC-135E's (tail #'s 326 and 374). The sixth ARIA crashed in Frederick, Maryland on May 6, 1981 with 21 lives lost (tail # 328), and the seventh and eighth ARIA (tail #'s 329 and 330) had been cannibalized and assigned other duties. Aircraft 375 was one of the first Apollo Range Instrumentation Aircraft (ARIA) put into service. Aircraft 894 is one of two active ARIA with in flight refueling capabilities. 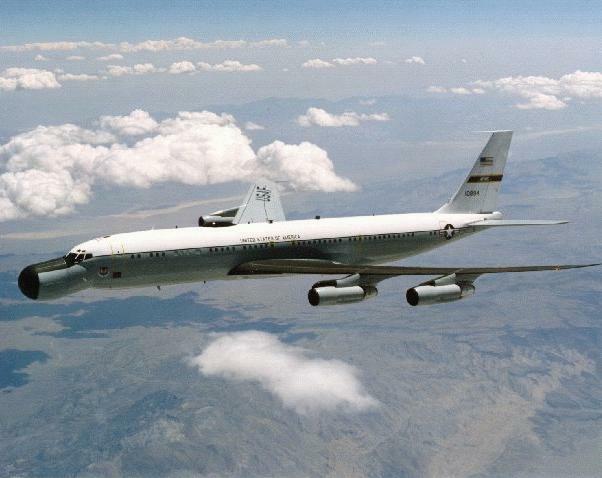 This aircraft is a modified commercial Boeing 707, and was one of four ARIA that have been upgraded with 4 MHz Racal Storehorse recorders and Microdyne S-Band, C-Band, P-Band Superheterodyne receivers. On 10 February 1998 the annual Force Structure Announcement formalized adjustments to the aircraft fleet at Edwards, which included the loss of one EC-18 and one EC-135 aircraft. These changes were the result a continuation of the normal fleet adjustments which occur at Edwards as test programs change and the general test aircraft fleet is upgraded and modernized. As of June 2000 Navy instructor pilots were using EC-18B's from the 452nd Flight Test Squadron to train naval aircrews who will operate E-6B Mercury aircraft. The E-6 provides communication links between national command authorities and U.S. strategic nuclear forces. Cadre from the Navy's Fleet Air Reconnaissance Squadron 7, or VQ-7, at Tinker Air Force Base, Okla., rotate to Edwards periodically to school student pilots and navigators aboard the EC-18s. Before flying five or six sorties at Edwards, students undergo numerous simulator "rides" at Tinker following initial aircrew training. After returning to Oklahoma, they make several actual E-6 flights before graduating from the program and joining the fleet to support U.S. Strategic Command at Offut Air Force Base, Neb. VQ-7 was using 452nd birds because one of its two aging trainers, a TC-18, was grounded after an FAA-mandated inspection. Looking for quick replacements, VQ-7 discovered the 452nd flies aircraft built on the same airframe, a Boeing 707, as their TC-18. And with the EC-18B Advanced Range Instrumentation Aircraft not flying as frequently as in the past, there was a readily available product for the Navy's immediate need. As of late 2000 all but two of the fleet have been retired, and these active EC-18s were in line to retire by 2003. 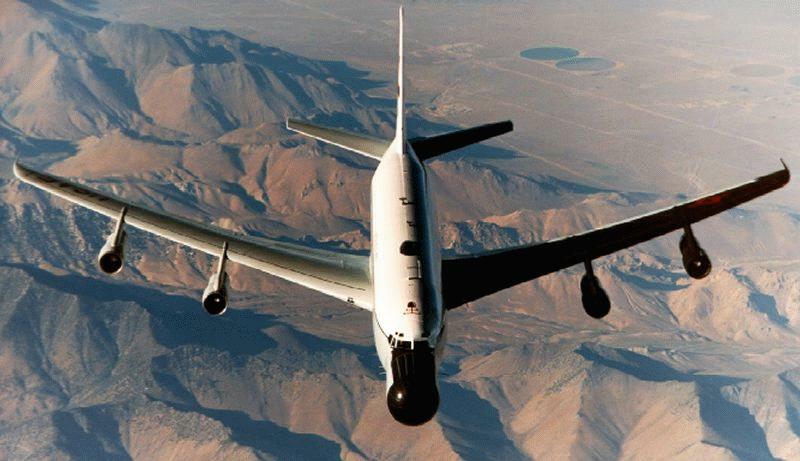 The last E model Advanced Range Instrumentation Aircraft flew its final mission 02 November 2000, from Edwards Air Force Base to Wright-Patterson. The ARIA was scheduled to go on display at the US Air Force Museum. The ARIA deploy throughout the world to obtain telemetry data from orbital and reentry vehicles as well as air-to-air and cruise missile tests. This includes support of tests conducted at Cape Canaveral AFS, Vandenberg AFB, Hill AFB, Eglin AFB, and from ships and submarines. Normally, the telemetry data is obtained in locations such as broad ocean areas and remote land areas which are outside the coverage of ground stations. Selected portions of the data may be retransmitted in real time, via UHF satellite, to enable the launching agency to monitor system performance. All data is recorded on magnetic tape for post-mission analysis. During orbital missions, ARIA shadows the path of spacecraft for about 2,000 miles, recording about 9,200 feet of magnetic tape, which equals 15 minutes of data. Selected portions of information oftentimes are retransmitted in real time via UHF satellite to the launching agency so it can monitor the craft's performance. For re-entry missions, ARIA traces space vehicles during the last three minutes of flight: from the edge of space to impact. Two EC-18s are equipped with high-speed still and motion picture cameras capable of infrared and spectral photography, which aids in determining vehicle survivability. The Cruise Missile Mission Control Aircraft (CMMCA) mission is different from both orbital and reentry mission types, primarily due to the mission duration which may involve continuous automatic tracking for more than five hours. Other differences include: the vehicle flies below the ARIA; real-time data is relayed via L-band transmitters directly to ground stations; and voice is relayed via ARIA UHF radios between mission aircraft (launch, chase, photo, etc.) and mission control. ARIA also flies as the primary remote command & control / flight termination system for these missions. These flights last longer than most, sometimes requiring five hours of continuous airborne tracking. If a missile accidentally veers off course or malfunctions, mission commanders can steer the device by remote control with an on-board joystick. On a typical mission, flown locally from Edwards AFB, a B-52 launch aircraft with the cruise missile departs its home base several hours prior to the ARIA takeoff. The ARIA joins the B-52 and acquires telemetry from the missile at about launch minus 90 minutes. The B-52 and the trailing ARIA then proceed to the launch area. At this point, mission control uses the ARIA telemetry data to evaluate the missile's status. Prior to launch, F-16 chase and photo aircraft join the B-52 launch aircraft. After final checks are completed, the cruise missile is launched and the B-52 departs the area. The ARIA continues to track the missile after launch, receives and relays telemetry data from the missile, and relays UHF voice from the chase planes to mission control. The ARIA tracks the cruise missile until termination of the mission. During most tests, ARIA supplies the primary remote command & control / flight termination system (RCC/FTS) signal to the missile. The CMMCA aircraft are divided into two groups: Phase 0 and Advanced CMMCA. The phase 0 CMMCA is used to monitor and control a cruise missile throughout its flight. The Cruise Missile Mission Control Aircraft (CMMCA) Phase 0 modification provides real-time telemetry displays and redundant RCC/FTS systems. The Advanced CMMCA provides the same capabilities as the CMMCA Phase 0 plus a tracking/surveillance radar for stand-alone operations as well as real-time data processing and display. Each ARIA has both external and internal modifications. 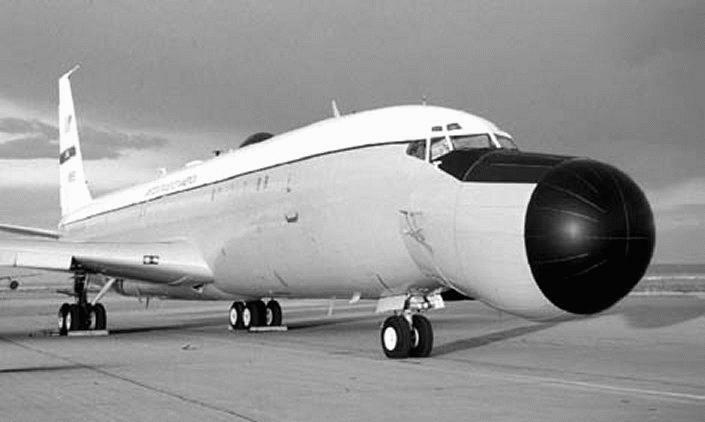 Externally the most obvious difference in appearance from a standard C-135 or C-18 aircraft is the large, bulbous, "droop snoot" nose, a ten-foot radome which houses a seven-foot steerable dish antenna. The ARIA also has a probe antenna on each wing tip and a trailing wire antenna on the bottom of the fuselage (EC-l35E only) used for high frequency (HF) radio transmission and reception. Further external modifications include antennas for data retransmission via UHF satellite. The internal modifications to the cargo compartment include all of the instrumentation subsystems (Prime Mission Electronic Equipment - PMEE) installed in the form of a 30,000 pound modular package. Also provided are facilities for the crew members who operate the PMEE. The Prime Mission Electronic Equipment (PMEE) is organized into eight functional subsystems to provide the ARIA mission support capability. The most obvious feature of the ARIA is the nose radome which contains the 83-inch parabolic tracking antenna. The acquisition and tracking of telemetry signals is the function of this subsystem, which is controlled by the antenna control assembly (ACA), and the antenna operator. The antenna subsystem currently has the capability to receive and track telemetry signals in the S-band frequency range from 2,200-2,400 MHz, primarily, and the C-band frequency range from 4,150-4,250 MHz. With additional modifications to this subsystem, ARIA can receive and record L-band and P-band frequencies. The S-band (UHF) antenna consists of the 83-inch parabolic reflector and a focal point crossed dipole array feed assembly. The feed assembly consists of an antenna array, a comparator network, interconnecting cables and associated hardware. The antenna array consists of four sets of crossed dipoles symmetrically arranged in a cross-hair configuration. The comparator network is a system of three passive photo-printed microstrip modules encased in aluminum housings. The purpose of the network is to form the right- and left-hand circularly polarized (RHCP and LHCP) sum and difference channels. The sum (data) channels are available for patching to the telemetry/tracking receivers. The difference channels are amplitude-modulated onto the sum channels by the scanner assembly and used for automatic tracking. Programs using telemetry frequencies outside the 2,200-2,300 MHz band have been supported by ARIA in the past. Reception and tracking of alternate frequencies can sometimes be accomplished with little or no modification to the ARIA. There are two modes of antenna tracking - automatic, in which antenna positioning is controlled by the antenna control assembly, and manual, in which antenna positioning is controlled by the antenna operator by using the handwheels or joystick. Automatic acquisition mode is selected by the antenna operator. Upon acquisition of the signal, the antenna system electronically simulates a conical scan of 3 dB off boresight to generate error signals that indicate in which direction the signal is off boresight. These error signals are routed to the telemetry/tracking receivers as amplitude modulation on the sum (data) channel, demodulated from the sum channel, and sent through the signal interface assembly to the tracking combiner/converter unit (TCCU) as tracking video. The TCCU converts the tracking video error signals to DC azimuth and elevation error voltages which are then routed through the antenna control assembly (ACA) to the servo amplifier, which in turn controls the clutches which engage drive motors to reposition the antenna. The Sonobuoy Missile Impact Location System (SMILS) combines airborne equipment with prepositioned Deep Ocean Transponder (DOT) arrays located on the ocean floor in various parts of the world to enable accuracy scoring of ballistic missile impacts during test firings. 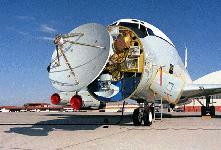 It uses an array of sonobuoys launched from the support aircraft to gather background acoustic information from the ocean environment and navigation information from the DOTs, and transmit this information as audio via RF links to the aircraft where it is recorded and a database is created. When the ballistic missile reentry vehicles (RVs) impact in or around the sonobuoy array, the buoys transmit the impact audio to the aircraft where it is recorded and combined with timing and the previously gathered buoy navigation data to compute an impact location and time for each RV. 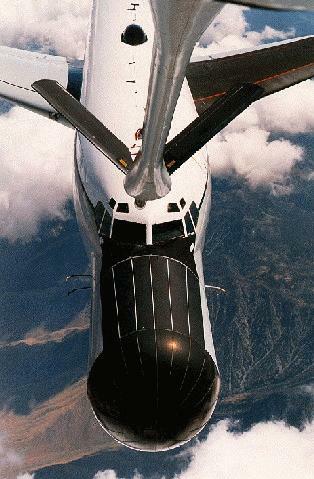 The ARIA optics system is a set of fixed staring cameras aimed out the left side of the aircraft designed for photodocumentation of ballistic missile reentries and impacts. It provides visual verification of RV cloud penetration, total number of RVs surviving to impact, visual anomalies, and time correlation of these events. During the missile reentry phase of flight, the ARIA flies a flightpath which is skew to the path of the RVs and approximately 15 or more miles away to avoid any chance of collision. During this period, the ARIA flies straight and level, the cameras are turned on, and the data is recorded on film and videotape. The heading and timing of this flight path are critical and carefully planned to ensure that all RVs remain within the field of view of both the cameras and the telemetry antenna at all times. After mission completion, the raw film is normally turned over to the using agency for processing. The rack containing the cameras and ancillary equipment is located on the left side of the aircraft next to the cargo door, surrounded by a light blocking curtain to prevent any aircraft light source from interfering with the pictures. Each camera looks through its own optical quality window, kept free of fog by forced, heated air, over a field of regard of approximately 40 to 130 degrees off aircraft heading (horizontal) and 45 above to 25 degrees below horizon (vertical). The optical windows which each camera looks through are manufactured by Perkin Elmer from Schott BK-7 type glass. These windows have been enlarged for the streak and framing cameras to expand their field of view; the windows are approximately 18 x 13 inches and 13 x 13 inches respectively. Total field of view depends upon camera and lens selected. Each of the cameras can be operated at the rack or at a remote operator station, where the operator can observe visual events in real time on a video monitor and flag events of interest on an audio track of the videotape. The system consists of four cameras, timing and control equipment, video recorder, and a vacuum pump. The ballistic streak camera is used for time exposures during twilight or nighttime conditions. As the RVs pass into the atmosphere upon reentry, they heat up and glow, and are recorded on film as streaks of light, separated horizontally due to aircraft forward motion. While the camera shutter is open, the aperture can be modulated downward at a known rate, thus providing relative time correlation. Additionally, electrical pulses corresponding to the aperture modulation and shutter opening/closing are recorded on the telemetry tape along with IRIG timing. Filters and spectral gratings are available for use with this camera. With the single available lens, it provides a field of view (az x el) of approximately 53 x 74 degrees at its optimum positioning. The framing camera is used for high quality still frame pictures at 1, 2, or 4 frames per second, and can also be used as a second "streak" camera. It places a decimal time annotation based on IRIG-B timing in the corner of each film frame with a resolution of 1 second, and also outputs electrical pulses corresponding to shutter opening/closing for recording on the telemetry tape. Filters and spectral gratings are available for use with this camera. With its single available lens, it provides a field of view (az x el) of approximately 53 x 74 degrees. The cine camera is a medium-speed motion picture camera designed to operate in a range of 10 to 200 frames per second. IRIG-B timing is placed directly onto the film edge for event correlation, and an electrical pulse corresponding to shutter opening is output for recording on the telemetry tape. Filters and spectral gratings are available for use with this camera. With available lenses it provides a field of view (az x el) of from 7 x 5 degrees to 68 x 57 degrees. The Advanced Range Instrumentation Aircraft needs technology development and advancement to support off-range flight tests of multiple simultaneous telemetry sources. The advanced weapons will continue to increase their launch ranges and payload complexity and to increase their test telemetry data requirements during future DT&E or OT&E flight tests. These airborne telemetry sources will have to be tracked from safe distances in spite of large hazard zones. The massive and multiple data streams from the targets will also have to be collected, retranslated, and recorded without sacrifice to the data quality. 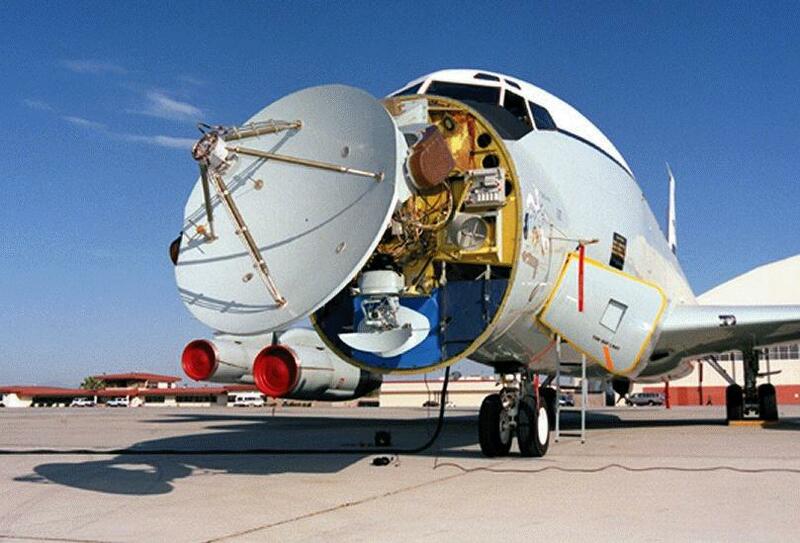 The physical size of current ARIA tracking antenna is not practical to increase because of the negative impact a larger radome would have to C-135 aircraft flying performance and qualities. The ARIA antenna is a dish design which does not lend itself to simultaneous tracking and telemetry from multiple data sources without severe penalty to data signal quality. The technology application/insertion necessary to provide low-cost high- performance telemetry-receivers must complement the ARIA antenna system. Large capacity data collection, processing and recording is necessary to complement the load created by the article's sources. Application of the above factors to some 25 worldwide airports produces maximum ranges varying from 2,800 to 4,500 nm without aerial refueling. Two ARIA currently have the capability to take on fuel while in flight. This greatly extends the maximum attainable range.